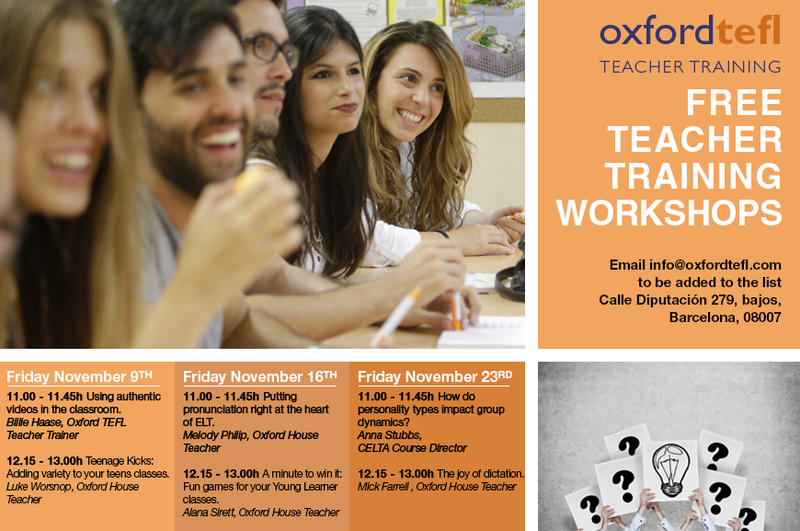 We are looking forward to the next round of free teacher workshops coming up at Oxford TEFL in Barcelona! Join us on one, or more, of the following Fridays to pick up some practical tips and develop your teaching skills from experienced teachers and trainers. As always, there will be snacks and drinks in the break which is another opportunity to network with other teachers in the city and enjoy our lovely garden. In this practical session you will be introduced to several techniques for using authentic videos in class, even with lower levels. We will have a look at a variety of videos and activities and how you can use those, not only to practice listening but also to improve your students’ speaking and writing skills. In this workshop you will pick up some new ideas for adding variety and keeping motivation high in teen classes. You will come away with some low-preparation activities which can be adapted to all levels and reused. Teaching pronunciation can be tricky and daunting. This highly interactive workshop is aimed at both new and more experienced teachers and will help you overcome your fear of teaching pronunciation. There will be an opportunity to share ideas with others, practice some activities and learn some top tips. Come and learn how to make grammar and vocabulary revision fun and engaging for your young learners. You will learn how to play some mini games and set challenges that your kids will love! Why do some groups of students or trainee teachers seem to work better together than others? Do cliques form in your staff room and what affect do they have? Why do personality clashes happen? By the end of the workshop you will have a clearer idea of how to improve group dynamics in your classes and with the people around you. We will explore ways of using dictation to minimize teacher talking time, increase student speaking interactions and develop fascinating lessons with minimal impact on the environment. No books. No photocopies. No whiteboard. This entry was posted in Barcelona, Careers, Location information, TEFL, TESOL, Workshops by Fran Austin. Bookmark the permalink.